Celebrates the beauty of the Atlantic coast of New England. Shore, sea and sky are shown symbolically. Not just any watercolorist, Lawrence C. Goldsmith of Fairfax, Vermont, and Monhegan Island, Maine, has been hailed by "Watercolor" magazine as a "Zen Master of watercolor." 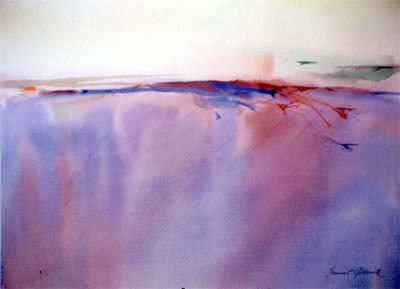 And "Artists Magazine" describes his paintings as "capturing the spirit of landscape." Thomas Hoving, the former director of the Metropolitan Museum of Art in New York, used the word "lyrical." Currently offered for sale, please e-mail for more information.